I’ll get to the beautiful white table setting mentioned in the title soon, but my goodness, it’s been a busy week. I can’t believe it’s been eight days since my last blog post! There are several reasons for this, the main one being that I simply didn’t have time to write one. It takes upwards of five hours to write, photograph, edit and optimise a blog post, and even longer when the social media sharing is factored in. On Thursday of last week, Harry made his debut for a new football team, (this is in addition to the one he already plays for), and played in Hull. The journey should have taken two hours, but took way more than three, due to heavy traffic and roadworks. In fact, my left quadriceps muscle went into spasm such was the stop-start action of my leg on the clutch. It’s still twitching intermittently now, six days later!) They played the 80 minute match and then we made the journey home. All told, it took more than seven hours- a significant part of anyone’s day. Football is a huge part of our lives and takes up two full evenings, some Saturdays and almost every Sunday morning. Luckily, I enjoy it, but even if I didn’t, I’d still take him and watch. Not only is it my role, it’s my privilege and I’ll do anything to support my children, their hobbies and their dreams. Harry had a good game and I thoroughly enjoyed watching him. It came at the end of an emotional day, because earlier, Poppy had got her GCSE results. The hard work she put it and her dedication paid off, because she did brilliantly and I’m very, very proud of her. She starts sixth-form next week and in two years, she will fly the nest. I remember her first day at school like it was yesterday and now we’re looking at university open days. The next two years will be gone in a blink of an eye, so I’ve made a (day-to-day) life-changing decision. I’ve resigned from my position as writer and editor of Aspire Magazine, a role I held and loved for three years. During that time, I learned a lot about the print industry and many different businesses and professions. I met countless inspirational people along the way and regularly undertook restaurant reviews, a brilliant perk of the job. It was a hard decision, but the extra time will enable me to focus on my blog and other freelance writing. I’ll be able to finish work at a decent hour. I’m looking forward to spending more quality time with my children and to relaxing, chilling and just being with them. I’m looking forward to cooking and baking, because I’ve lost my mojo and I’m bored of the same old same old. I want to rekindle my love of cooking and entertaining. 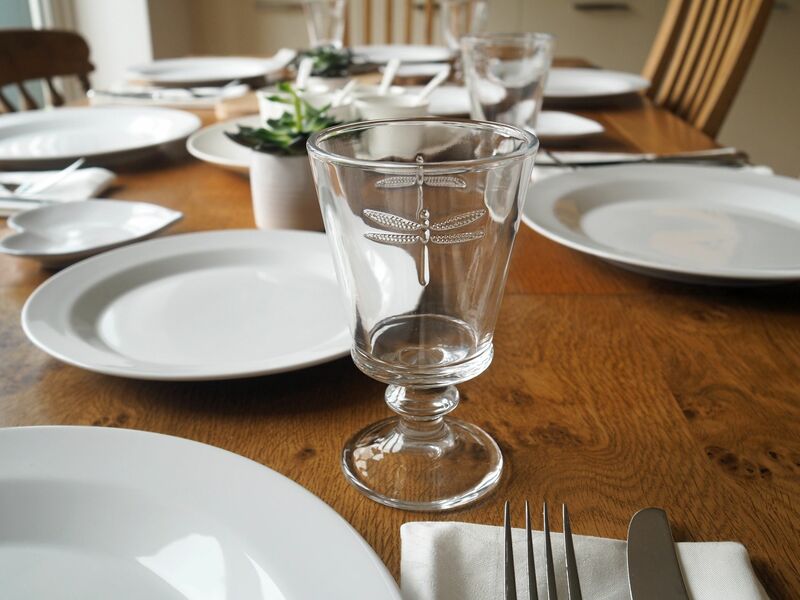 I recently got some gorgeous new crockery and glasswear which also made its debut last week. Making the table look pretty is all part of the occasion and something I enjoy doing. 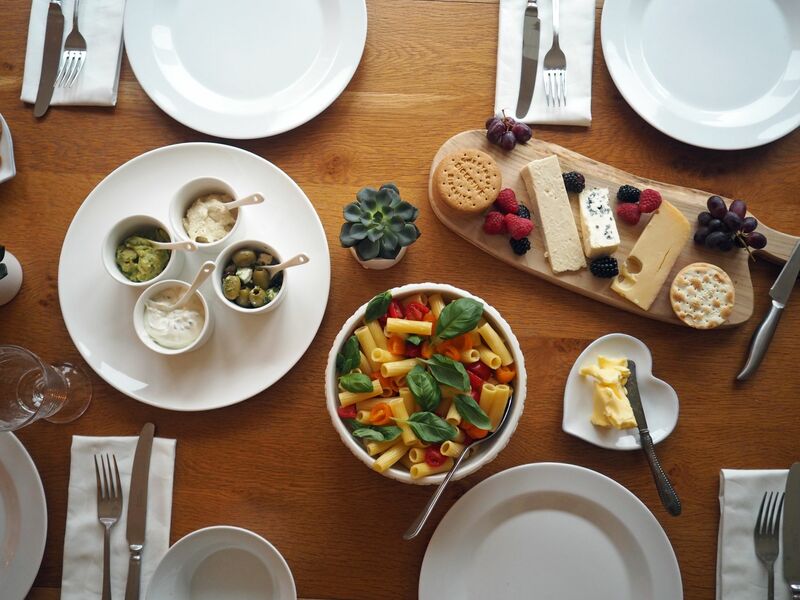 To celebrate Poppy’s GCSE results, I hosted a small dinner party for her on Friday evening. I invited one of my children’s close friends George, who also got great GCSE results, and his family. Ian was here too, taking the total to seven. 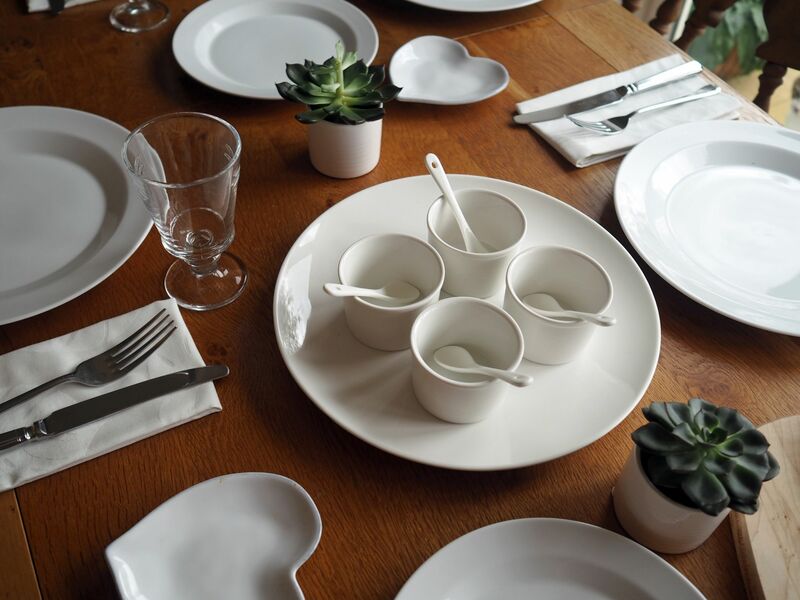 A white table setting is elegant, chic and versatile. It makes an impact yet is understated. 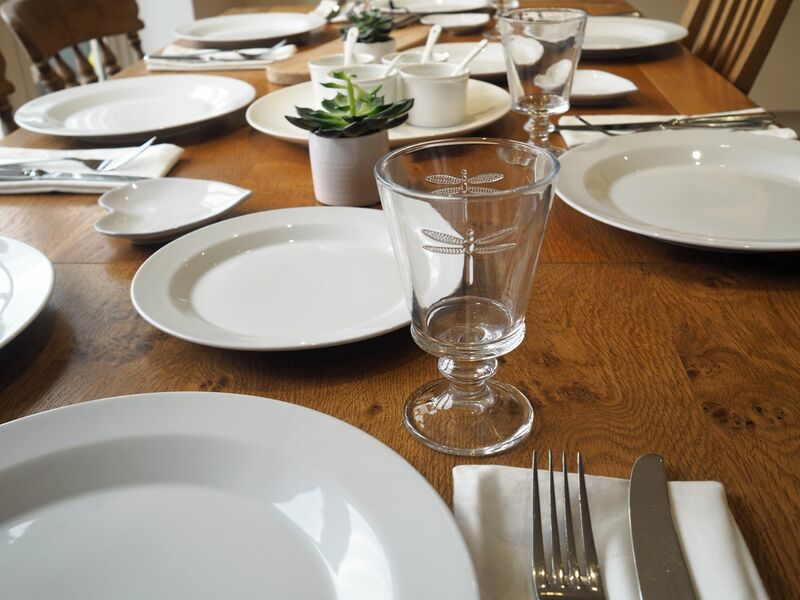 The dinner plates are part of the *James Martin Everyday 12 piece boxed set, by Denby, which contains four 28cm dinner plates, four 22cm salad plates and four 16cm diameter bowls). I added some small succulent plants to the table to compliment the linen napkins I’ve had for as long as I can remember. 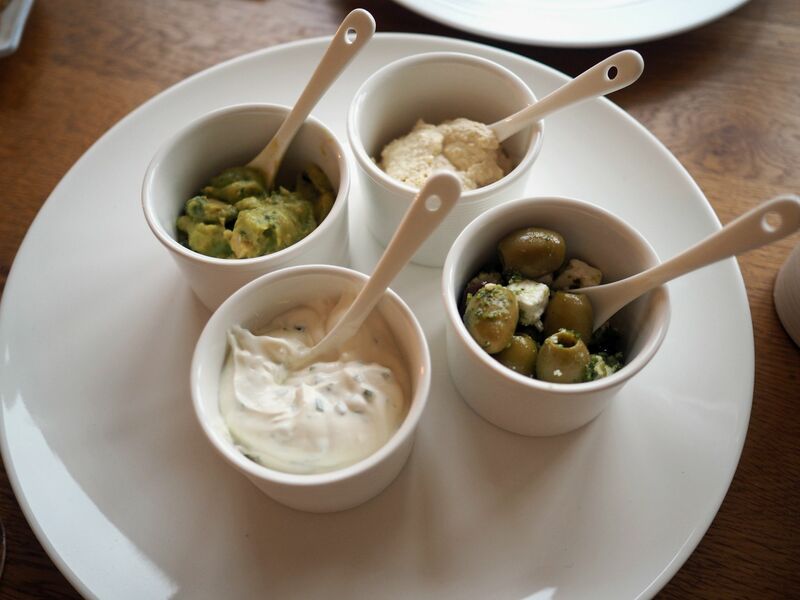 Poppy loves olives and dips which and this *Gastro by James Martin 9 piece serving kit, is perfect for presenting them. 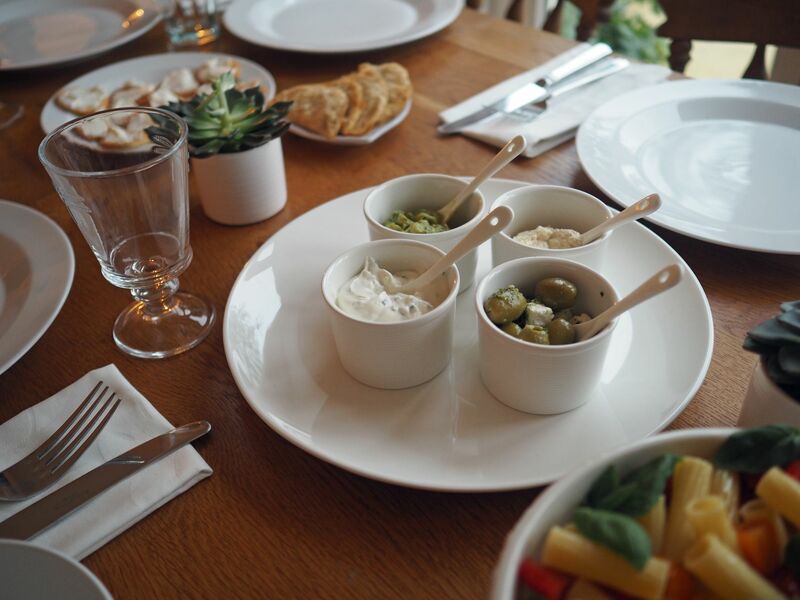 (The kit comprises a 30cm ceramic platter, four ceramic spoons and four ramekins). I should point out that all are suitable for the oven, microwave and freezer and are dishwasher safe. For a formal dinner, I have glasses for both wine and water. Often though, lack of space means it is more practical to one glass for both. These beautiful *short dragonfly goblets fit the bill perfectly. They’re ideal for a casual setting. The *sycamore live edge serving paddle board, is another versatile addition to the table. I use it for cake, bread, tapas and cold meats as well as cheese. It was crafted by Smith Originals, a small artisan brand. It has special meaning because the carpenter is the partner of one of my school friends. Please do take a look to see the rest of his bespoke creations including dining tables and storage tables. 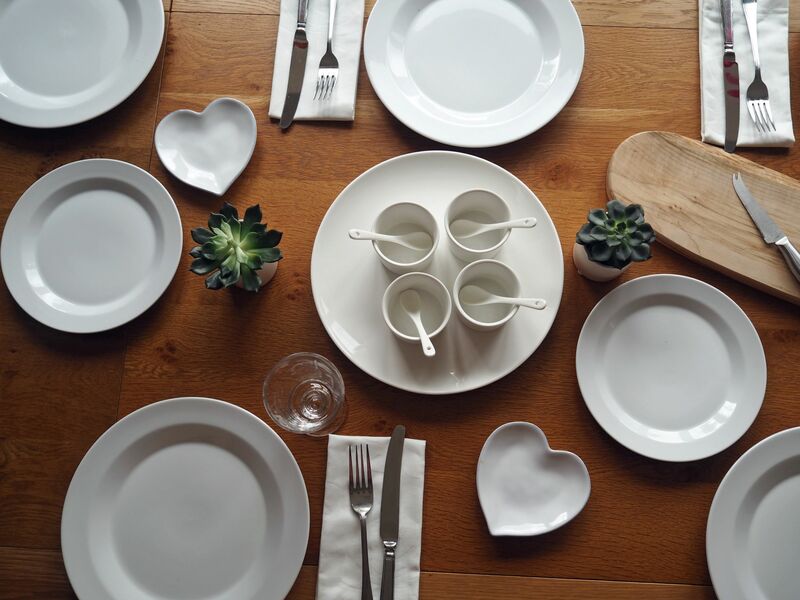 In between the other pieces of the white table setting, I added some little white heart-shaped plates. 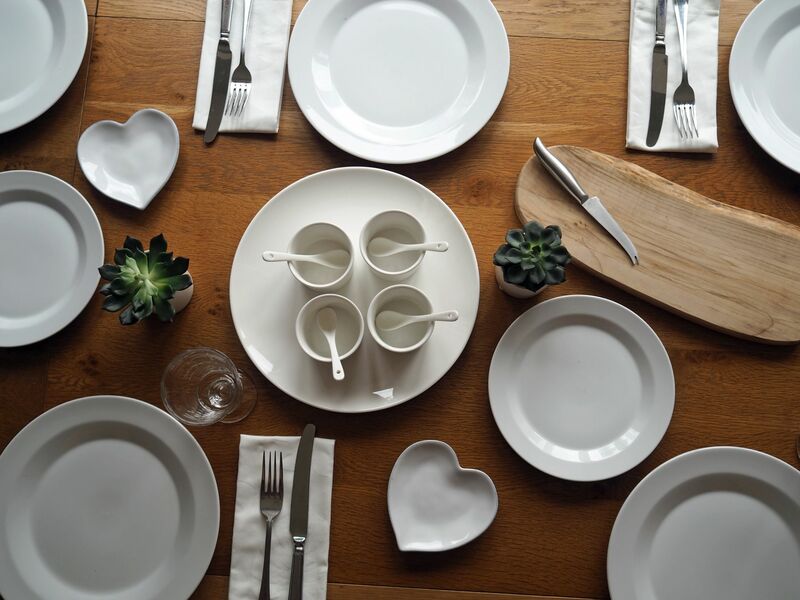 They are the Porto Stoneware Heart Side Plates from The White Company which I have had for several years. Again, they are dishwasher safe and useful for sweets, biscuits and nuts too. 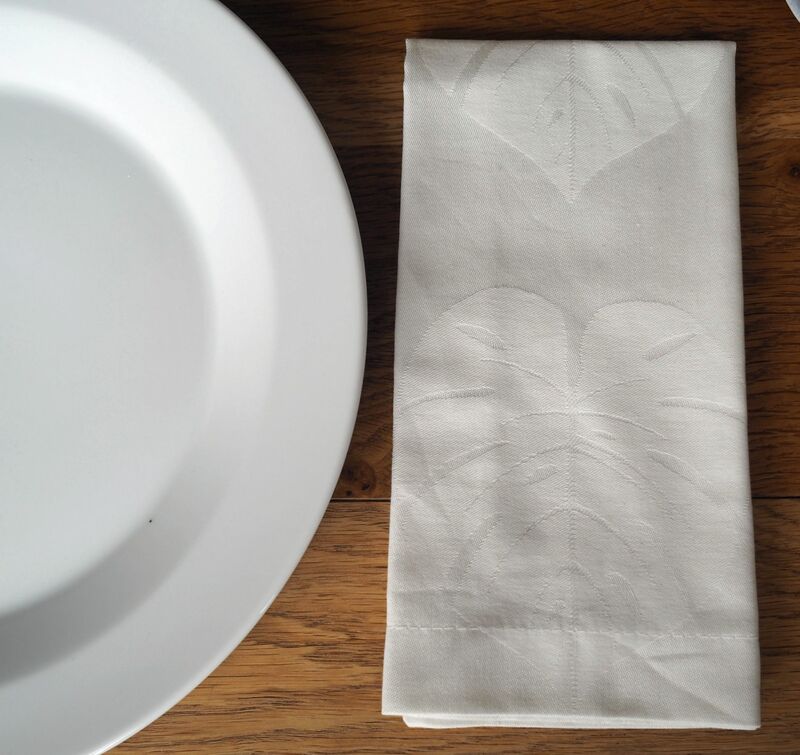 I’m looking forward to ringing the changes to the white table setting. I bought some brightly patterened tapas dishes in Nerja, which will be perfect for adding a splash of colour. Most of all though, I’m looking forward this new chapter of my life and the day to day changes it’ll bring. It should be a very happy autumn. Thank you as always for supporting the brands that support my blog and me. Later this week I’ll be linking this post to Brilliant Blog Posts and The Saturday Share. Previous Post Short Wellingtons And A Mohair Serape: Excellent Additions To A Transitional Wardrobe. Well done to your talented offspring! And well done to you for making the decision to blog full time. If you discover the secret to working shorter hours as a full-time blogger, please, do let me know! Ha ha! How wonderful that your kids are so talented and well-adjusted. Congratulations on your big decision, and I truly believe that you’ll find it very rewarding. 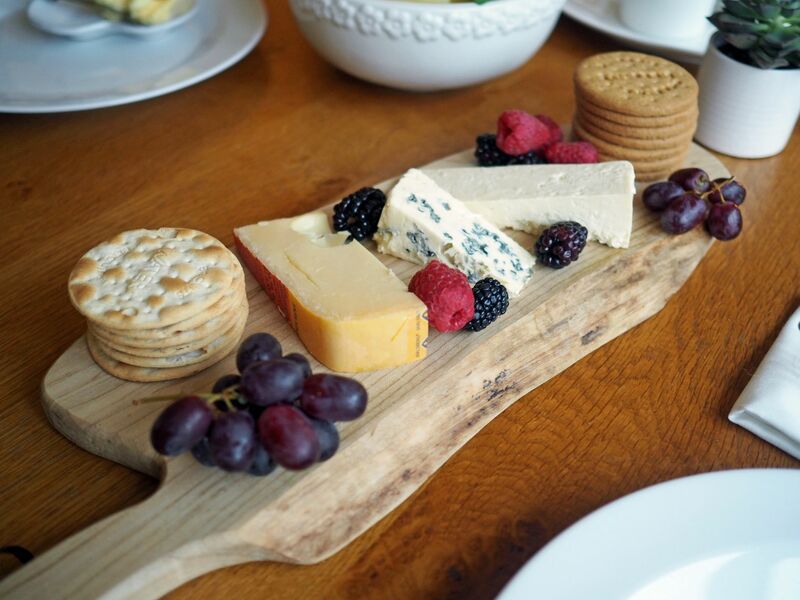 Gorgeous table setting: especially that cheese board! LOVE IT! An absolutely wonderful table. I love the white monocoromo and all the delicate and beautiful complements. The decor is great. Elegance and modernity. Even though you’d already told me about your big life changing decision, reading this brought tears to my eyes. I know how much you’ve sacrificed for your children & admire you immensely. Leaving a job to spend precious time with the kids may not seem sensible to some people but I am most certainly not one of them! There is a fine balancing act to this that takes enormous courage & faith in ones self to pull off. I know for sure YOU WILL DO IT WELL. Dear Lizzy, it must have been difficult to make this decision as your job was such a nice one. But if there is no balance between spending time with your loved ones (+ some rest) and work, then you should restore that balance. And in favour of people you love. They are the most important in your life. And yourself of course. You need rest too. I take it you can afford quiting your job and I am happy you can. So often people cannot and wind up with a burn-out. Which is not funny at all. And your table setting is chic. I really like the dragonfly cups!!! (If you listen close enough you can probably hear an entire chorus of girls saying the exact same thing). Thankfully we don’t have that kind of traffic where I live but I have experienced the 405 in California and it truly was a nightmare. And that wasn’t even in a stick-shift.